Share the post "Pilot Project on Anaerobic Digestion of Equine Manure"
An on-going challenge for horse owners is handling the never-ending pile of equine manure. It is estimated that a 1,000 pound horse can generate approximately 0.85 cubic feet per day or 8-10 tons of manure a year. Also, at an average of 2 cubic foot per day, horse bedding can add up to 27.0 cubic yards of waste materials annually to the manure. 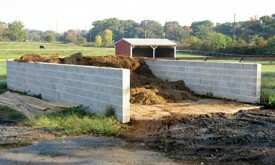 On small horse farms where horses are confined in stalls, manure and bedding are removed regularly and can accumulate in large piles. Rural runoff from farms can pose risk to water quality if manure piles are located near paved surfaces or drainage or creeks or streams. 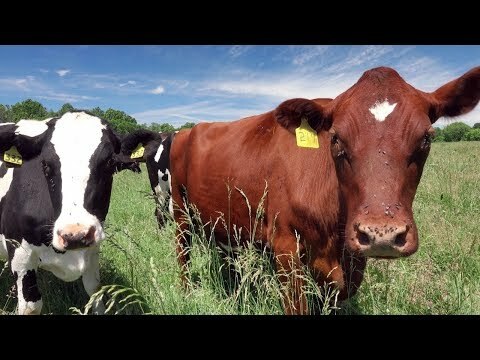 Animal waste that accumulates on farms requires proper management. Many horse farms handle this problem by composting the manure, which produces a good source of organic matter for gardens and farms. The age old production of compost is a beneficial way to dispose of this constant stream of waste, but modern technology offers another method of disposing of the waste with the benefits of reducing odors, handling and processing, plus the added potential of energy production. Anaerobic digestion breaks down organic matter such as manure and bedding in a digester unit which produces methane gas. The gas is captured, cleaned, and can be used like natural gas to power a generator or boiler to heat water to produce steam. This year a pilot project of using anaerobic digestion on a New Jersey horse farm is being launched in Monmouth County. The cooperative project involves the Animal Science department at Rutgers NJAES, with funding from a Conservation Innovation Grant from Natural Resources Conservation Service. Spectrum BioEnergy is providing the small anaerobic digester which is now set up on the farm. Dr. Michael Westendorf, Rutgers NJAES Extension Specialist in Animal Science, explains that initially the gas will be flared off rather than collected, but in the future they hope to demonstrate its use for energy production. As the first anaerobic digester on a small farm in New Jersey, the project may help pave the road for improving the approval process for anaerobic digestion of animal waste in New Jersey, as well as introduce the feasibility of cooperative use of an anaerobic digester by several farms, since the costs of purchasing a unit can be prohibitive. With the equine industry as the largest livestock sector in New Jersey, this alternative manure management method can help the industry lighten its environmental hoofprint. The farm will be hosting demonstration days of the anaerobic digester in the Spring of 2013.